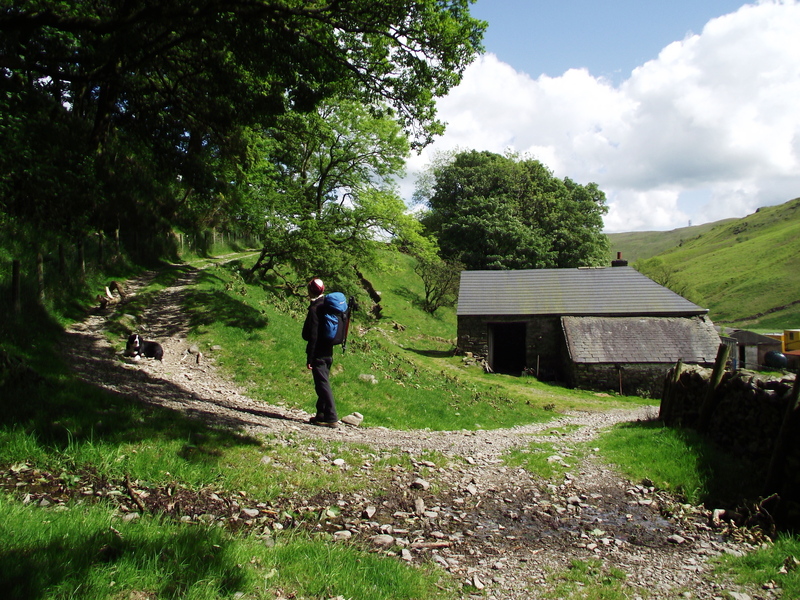 We went walking in Borrowdale last week in good weather, and saw only two people all day…What?!! I should add that it was “The Other Borrowdale”, otherwise known as Westmorland Borrowdale. The Cumberland Borrowdale, near Keswick, is the one that most people know well, drawing in walkers, climbers or people who just want to admire one of the most attractive valleys in the English Lake District. Its namesake in the old county of Westmorland is quiet and neglected, and a good thing too! 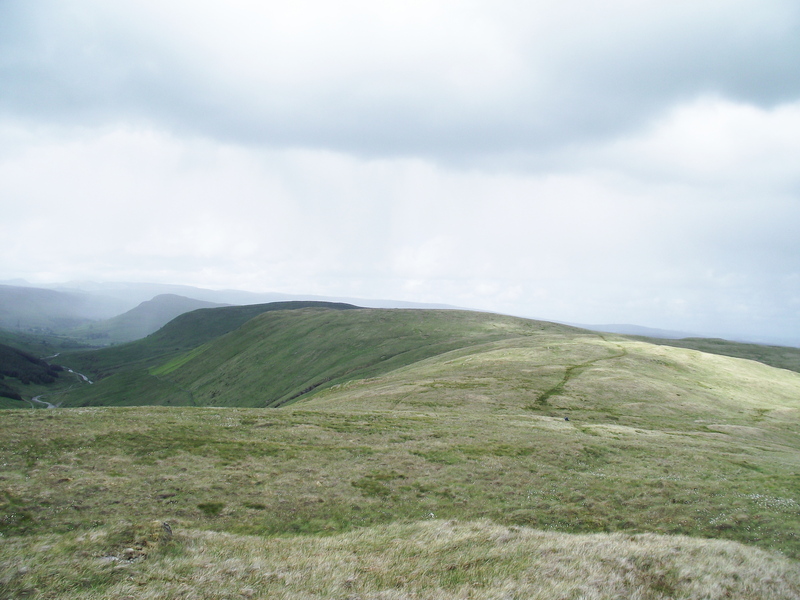 The reason for the neglect is simple – most walkers don’t know that these hills exist. Borrowdale beck rises in the backcountry that is dismissed with the broad title of “Shap Fells”. Just to confuse fans of the Lake District, there is a Wasdale and Wasdale Head just up the road about three miles away, but these are not Lake District hills really – they are more reminiscent of the nearby Howgills, and share the same sense of peace and quiet. I have only been here on two other occasions, and that’s in forty years. No mist on this walk though, apart from ‘Mist’ our Border Collie. 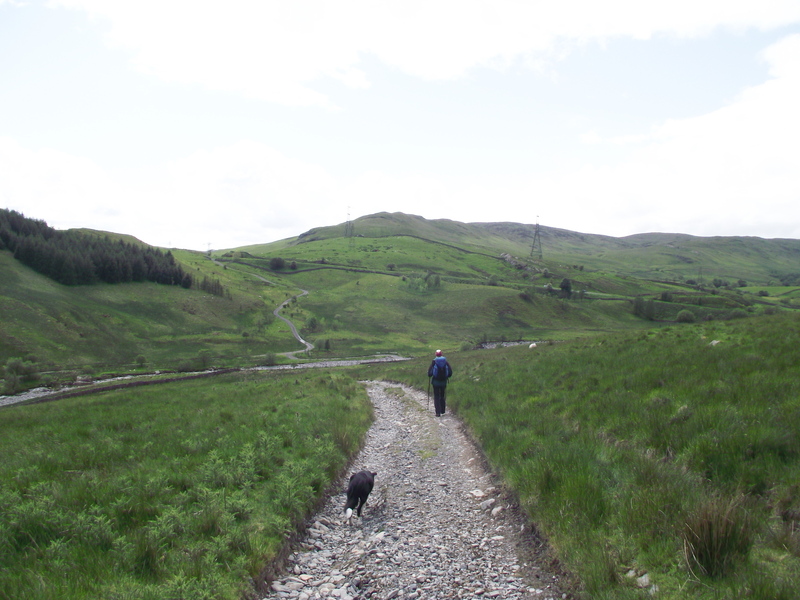 We set off from Roundthwaite near Tebay and took a gently rising path up to Roundthwaite Common. From there it was big skies and easy walking to Winterscleugh then on to Whinash, passing en route the small unnamed lump at 454 metres height that had nearly caught me out all those years earlier. From there we headed for the intriguingly named “Breasthigh Road”. In places the track has been washed out by storms, and at times we walked in the track, not on it! From here we had to drop down to Borrow Beck, to return down the valley bottom. 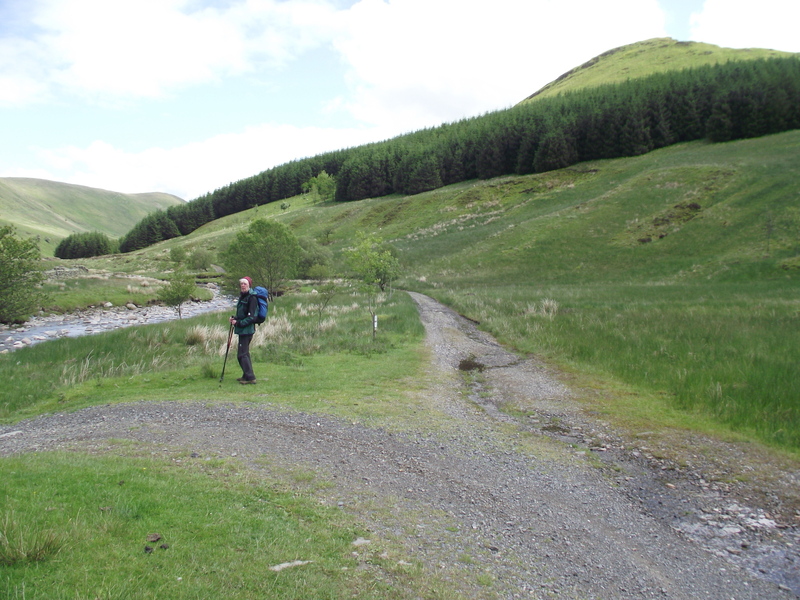 I couldn’t remember how I had crossed the beck on what had been my second visit to these hills in the mid 1990’s, but there was no bridge marked on the map. When Chris asked how we were going to cross, I muttered something about carrying her across if necessary, but the day (and my face) was saved by the biggest stepping stones in the world. From there it was a pleasant walk down an easy track heading back towards the start point. We passed quickly through flower meadows that you would never find in the tourist traps of the Lake District, then on to the ruined farmhouse at High Borrowdale followed by the next farm at Low Borrowdale. 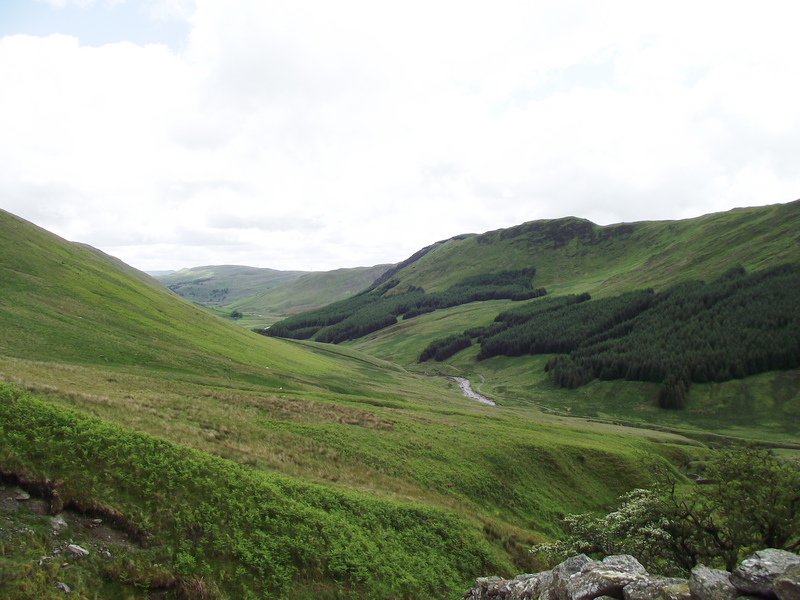 From here we had intended to continue down to the A685, with a 1.5 kilometre road walk to follow. Chris and I agreed that this was a poor way to finish, and instead we set off upwards once again, re-crossing the ridge to return direct to Roundthwaite. The dog wasn’t given a vote, but appeared to support the decision. This entry was posted in 4. 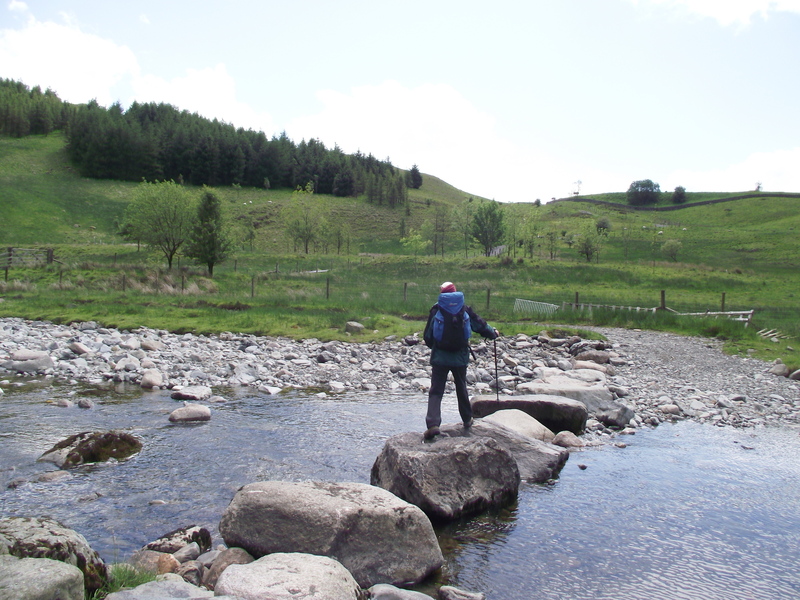 Northern England and tagged Borrowdale, Cumbria, hillwalking, Howgills, mountain rescue, mountains. Bookmark the permalink. 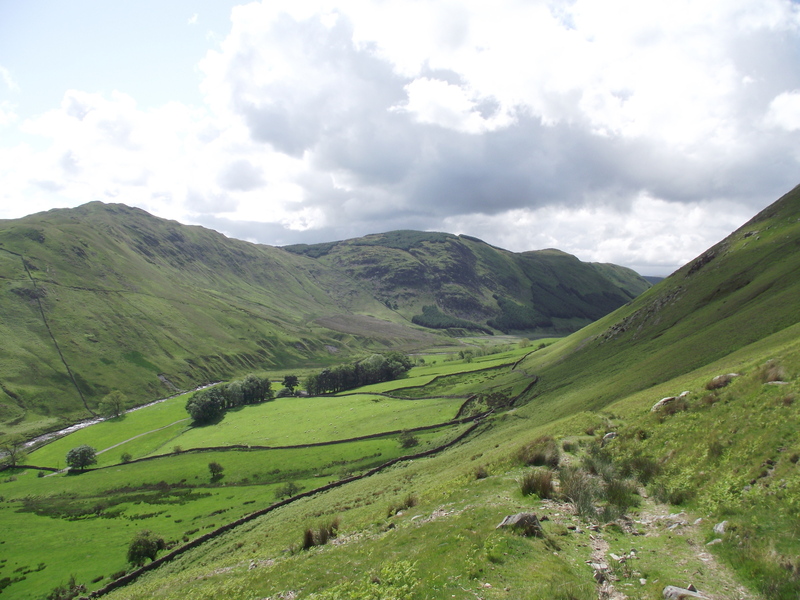 You can visit the meadows from the A6 end of the valley – Borrowdale is mid way between Shap and Kendal, at the bottom of the long, long hill you descend heading south. The meadows are there thanks to Friends of the Lake District; they have also been involved in long term tree planting in the valley. It’s about 2 kms down a gradually descending track (plus 2 kms back of course) – If you get to the ruins at High Borrowdale you have passed the meadows. Can’t say I know this Borrowdale either. Looks a good place to walk during the summer when the crowds are about else where. 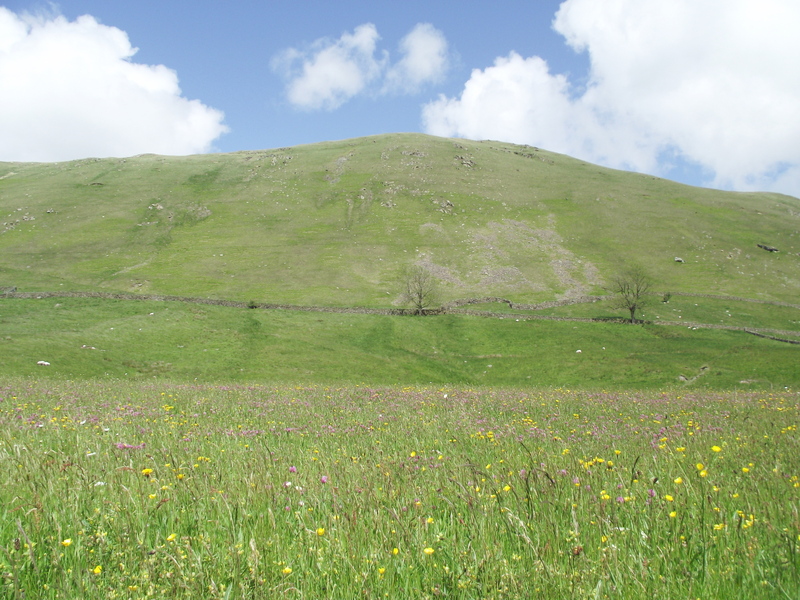 The Howgills are under valued as well. It’s a great place to visit – I ran both ridges in one trip when I was younger and fitter, and as mentioned in the blog, Chris and I (and t’dog) are going back for the south ridge in the near future – watch this space!